The last time both Paul McCartney and Ringo Starr both performed in Kansas City in the same year they were onstage together at Municipal Stadium. 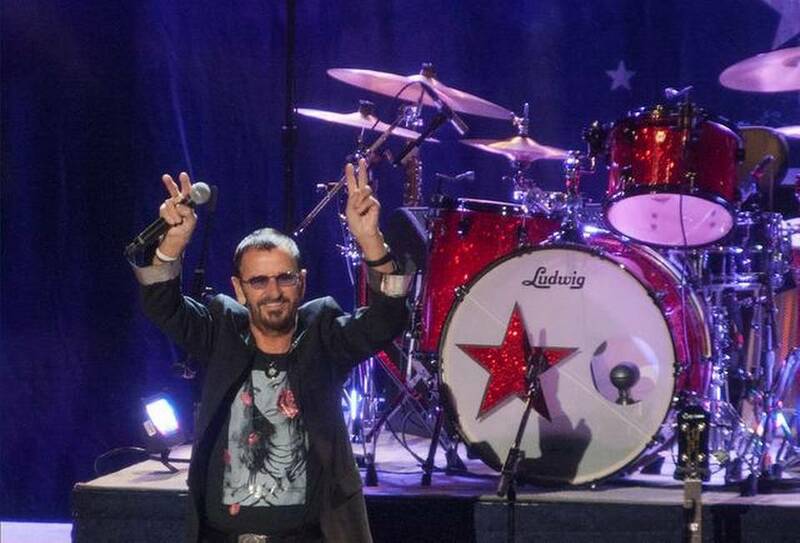 The Fab Four’s drummer gave his first performance in the area since 1992 on Saturday night, only three months after McCartney’s concert at the Sprint Center. Starlight Theater wasn’t quite full, but judging from the crowd’s reaction to “Yellow Submarine” and “With A Little Help from My Friends” many people had waited a long time for this moment. Several members of Ringo’s All-Starr band were also making belated returns. Bass player Richard Page congratulated the Royals for their playoff success and noted that last time he played Kansas City his band Mr. Mister was opening for Tina Turner, and the Royals had just won the World Series. Guitarist Steve Lukather said he couldn’t remember the last time he was here. Now in its 25th year and 13th iteration, the All-Starr Band works as a round-robin jukebox with each musician taking the spotlight, then introducing the next band member up. Guitarist Todd Rundgren was the biggest name on the bill aside from the headliner. While the other names may not have been as familiar, the songs they helped take to the top of the charts – “Rosanna,” “Evil Ways,” “Broken Wings” – definitely were. The seven-piece band had the most opportunity to stretch out and show off on the Santana numbers – “Evil Ways,” “Oye Como Va” and especially “Black Magic Woman/Gypsy Queen” – lead by organist Gregg Rolie, a founding member of the Santana band. Lukather handled lead guitar duties for most of the night, but seem to save his best solos for those songs. Surprisingly, the band also jammed over a slowed-down Bo Diddley beat during Toto’s “Roseanna.” Rundgren’s “Bang on the Drum” incorporated a bit of “Low Rider” during Page’s bass solo. The only unfamiliar song in the two-hour set was Page’s “You Are Mine.” Rundgren’s amazing guitar arrangement for the ballad showed why he has been an influential and in-demand producer for several decades. The night closed with the introduction of Billy Shears and “With a Little Help from My Friends.” As the song was winding down, the band jumped into John Lennon’s “Give Peace a Chance,” a fitting tribute to the man who has made peace and love his motto. Setlist: Matchbox, It Don’t Come Easy, Wings, I Saw the Light, Evil Ways, Rosanna, Kyrie, Bang the Drum All Day, Boys, Don’t Pass Me By, Yellow Submarine, Black Magic Woman/Gypsy Queen, Honey Don’t, Anthem, You Are Mine, Africa, Oye Como Va, Love is the Answer, I Wanna Be Your Man, Broken Wings, Hold the Line, Photograph, Act Naturally, With a Little Help from My Friends > Give Peace a Chance.